I was thrilled at the chance to step into our community and see why one of Sapulpa School’s group of kids is called the “Green Thumb Chieftains” by their job coach. For the past fifteen years or more, Shawna Keizor has been taking students from Sapulpa High School to Dr. Denham’s Animal Clinic in Kellyville for the school’s Community Job Training Program. His wife Nita met us as we arrived and gave a quick tour of their lovely property. Their generosity with the farm was not lost on me. 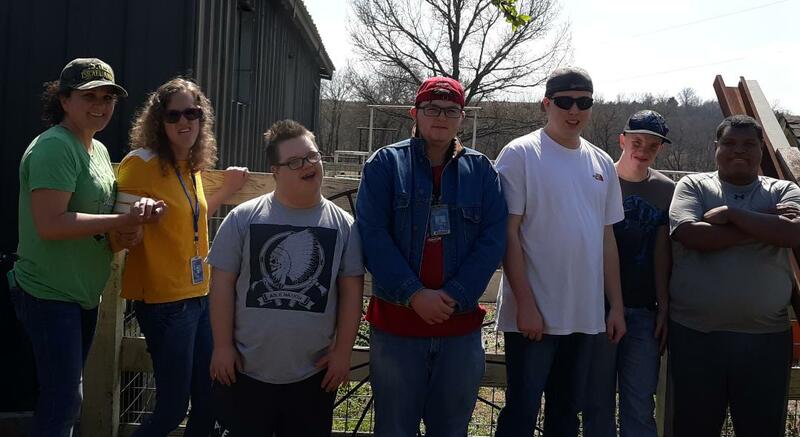 It is here that six teenagers from Sapulpa High have daily jobs which can be anything from feeding the assortment of farm animals the proper amount of hay and fresh water, keeping the stalls mucked, weeding gardens, collecting eggs and much more. Recently, a greenhouse was added to their program. Shawna has been a job coach with the high school for the past twenty-six years. She lights up when she talks not only about “her kids” but also how the greenhouse was a “God idea” and how watching it take shape was amazing. She prayed, collected information and presented the School Superintendent Rob Armstrong with the idea and the rest is history. The greenhouse allows the kids to grow vegetables and flowers during the entire school year, instead of the raised beds outside which limits growing time. They can also work in the greenhouse in any type of weather. Two volunteers, Sandy Dimmitt-Carroll and Master Gardener Jim McKown teach the kids about planting, labeling, transplanting and more. Everything is grown as organically as possible. Master Gardener Jim McKown and student Dylan talking about their plants. Local companies donate items such as gravel, trash cans for soil storage and more. The kids get to eat what they grow, use them in class and sell the plants to help fund their program. It’s a win-win for everyone and is bringing the community together. How can you help? They always need donations of potting soil and monetary donations are tax deductible. They have several plants for sale. Currently available are cabbage, broccoli, cauliflower, strawberry hanging baskets and cosmos flowers. Within the next two weeks they should have tomatoes, peppers, sunflowers and basil. What a great way to jumpstart your garden and help this amazing program! Please contact Shawna Keizor 918-857-6038. I can’t say how important learning these skills are – hard work, dedication, growing food, responsibility, patience and cooperation. Farm work and gardening are priceless. The atmosphere was so fun and light-hearted; I can see why they call it “the happiest place on earth.” Thank you students for showing me around, I am so proud of all of you!